I’ve noticed some hot buzz words of late—such as “treatment-free,” “natural,” or “Darwinian” beekeeping, or the “rewilding” of the honey bee. I feel that it is worthwhile to explore these concepts from an objective practical and evolutionary perspective. My hope is to facilitate rational discussion of our options for solving The Varroa Problem. The Varroa Problem is not just a bee/mite issue—it’s an evolutionary event in which viruses and beekeepers are fully involved players. Varroa would likely no longer even be much of a problem if it were not for the fact that some of our beekeeping practices work in favor of the mite and Deformed Wing Virus (DWV). The Solution to The Varroa Problem is for beekeepers to better understand how their management practices affect the evolutionary pressure upon the bee, varroa, and DWV. I’m 100% behind the concepts of “natural” and “treatment free” beekeeping, but as a biologist, am concerned that many who think that they’re helping, are actually inadvertently working against the natural evolutionary process. There are ways to be part of The Solution, but they’re a little more involved than simply withholding treatments for varroa. In this two-part article, I hope first to dispel some myths, then explain how the coevolution of varroa and DWV created a monster, how beekeeping practices play a part in the evolutionary selective pressure, and then to objectively rank different management approaches as to as whether they qualify as being part of The Problem or part of The Solution. Along with the explosive increase in recreational beekeeping, there comes a good deal of passionate arguing about the “best” way to keep bees. These debates often seem to be more about a beekeeper’s ideology or tradition rather than about actual bee biology, and often devolve into the mere repetition of rigid dogma rather than the constructive weighing of evidence and analysis of the long-term evolutionary consequences to the bee. The British Columbia Honey Producers Association publishes an excellent quarterly called Bee Scene. In last fall’s issue , an article by beekeeper Kerry Clark caught my eye– “Mutual Respect in the Treatment-Free Debate.” I’m in full agreement, since either side has grounds for making a case. I find closed-minded finger pointing, blaming, and demonization of others to be counterproductive. Although proponents of either side can convincingly rationalize and justify their positions, the truth is that both sides are often right, and both sides are often ill-informed about the biology involved. Are large-scale commercial beekeepers part of The Problem? For the most part, yes. Are small-scale “treatment free” beekeepers part of The Problem? For the most part, also yes. Practical application: both of the above are the wrong questions to be asking. May I suggest that it is more worthwhile to be “pro” a desirable goal, rather than “anti” this or that. Our goal is healthier bees, free of The Varroa Problem. So the question that every beekeeper should ask themselves is, are you being part of a realistic solution? There are ways that every beekeeper, depending upon their circumstances, can help to be part of The Solution–or at least less a part of The Problem. But first we need to clearly define exactly why we still suffer from The Varroa Problem thirty years after the invasion of the mite. It’s all about the biology and evolutionary processes involved in bee/mite/virus/beekeeping dynamics. It’s actually relatively straightforward to understand, but without a clear understanding of the evolutionary selective pressures resulting from our various beekeeping practices, any efforts to solve The Problem will be futile in the long run. The main problem that I see is that much of the discussion that I read is based upon erroneous information, so I’d first like to go over some easily-verifiable facts. The oft-repeated alarm about the “decline” or “imminent extinction” of the honey bee is a false narrative—beguiling but unsupported by fact. It’s true that the varroa/DWV complex has made beekeeping more difficult than it used to be, but the simple fact remains that the number of managed colonies of bees is increasing in the U.S. as well as in most every other country. Practical application: the health of honey bee colonies will indeed decline if varroa is not managed. But if varroa is kept to a low level, my colonies appear to be as healthy as they’ve ever been in my 50 years of beekeeping. Many professional beekeepers are enjoying financial success these days. Let’s look at the oft-trumpeted colony mortality figures. Under natural conditions, the honey bee population in any area will swing up and down over the years, the majority of colonies perhaps dying when there is a severe winter, prolonged drought, or some plague, but then during good times the population quickly rebounding until it reaches the carrying capacity of the land. So let’s imagine that there is a consecutive series of good years, and that a “stable” population of wild honey bee colonies has come into balance with the available floral resources. Under these perfect conditions, what percentage of colonies will die each year? Let’s do the math. Under perfect conditions every single colony will swarm at least once during the season—thus temporarily doubling the population. But if the overall population of colonies is to remain stable, that means that at least half the colonies must die each year. And this is where natural selection takes place—with the most “fit” colonies having a better chance of surviving Fig. 1. Figure 1. Life is tough for colonies living in the wild. Their success at surviving until reproduction in their second season is low. The unforgiving environment exerts strong selective pressure for “fitness.” The addition of varroa/DWV to the environment has added another component to that required fitness. 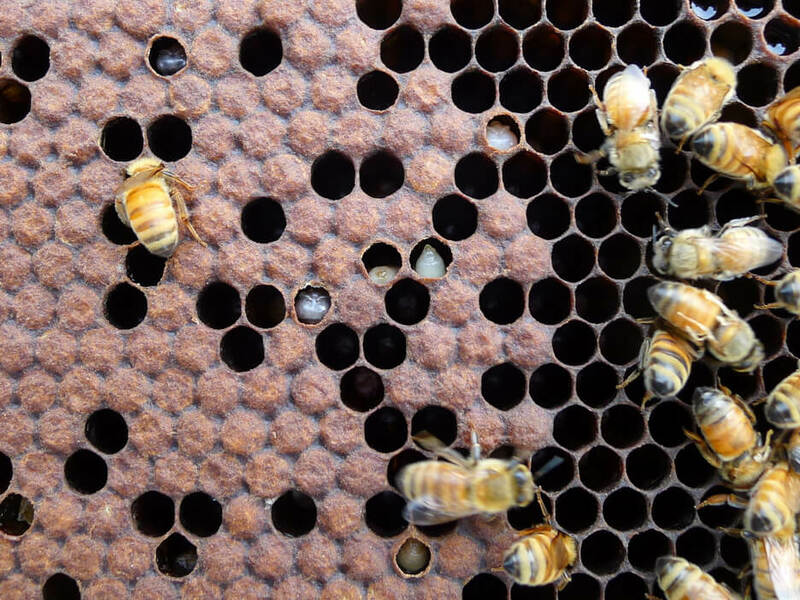 Practical application: don’t let the elevated colony loss rates from those who aren’t adequately controlling varroa mislead you—the honey bee, left to its own devices, is a survivor, and is going to do just fine. Keep in mind that if you go out of your way to help slacker (less fit) colonies to survive, that you are working against the natural evolutionary process. Start each season with more colonies than you plan to take through the winter—and cull those that don’t perform. Here lies a great opportunity for beekeeping in several countries, where economic constraints are no longer leading as beekeeping has become a hobby sector, with dispersed and small apiaries being the rule. Sustainable solutions for the apicultural sector can only be achieved by taking advantage of natural selection and not by attempting to limit it. Practical application: I fully support the efforts by those involved in sustaining threatened races of honey bees in their native lands. Recreational beekeepers in those countries can be part of The Solution. On the other hand, in North America the honey bee is a well-established, but non-native invasive species. Its presence is not necessary for the survival of native species of plants—a function that is well-performed by native pollinators, who may in fact face competition from the honey bee. Thus, the honey bee is not a necessary component for the functioning of natural ecosystems on this continent. That said, we North Americans place great value on the honey bee to perform pollination services of agricultural crops, as well as for producing honey and beeswax. As such, bees kept for these purposes can be considered as domestic livestock. In addition, many recreational beekeepers enjoy keeping bees simply as pets. Practical application: when bees are kept as either livestock or pets, it confers upon the keeper the responsibility to provide for their care (Fig. 2), and to be respectful of other beekeepers’ operations. The unmanaged bee population not only doesn’t need our help, but may be harmed by well-meaning recreational beekeepers (I’ll explain further on). Figure 2. As an example of our ethical responsibility to our livestock, I offer the above snip from the Grass Roots Farmer’s Cooperative. The practice of good animal husbandry requires that those who are responsible for their livestock control external parasites (in our case, varroa). Furthermore, we should each be part of a plan to improve the resistance of our animals (our bees) to that parasite. Another false claim is that our beekeeping practices are not sustainable. Clearly, we need to wean ourselves off our miticide dependence for varroa control, but there are plenty of beekeepers who could correctly claim that their management practices appear to be sustainable for the foreseeable future. A case in point: my sons and I have a 35-year history of supplying, without fail, healthy, strong colonies for almond pollination. In recent years we tripled the size of our operation, all the while selling off about a third of our bees as nucs each spring. And we do so without the use of synthetic miticides, and the rare use of an antibiotic. Our operation and methods appear to be fully sustainable. A third myth is the claim that one’s beekeeping practices are “natural.” In reality, as soon as a beekeeper sets up an apiary, they’ve created an unnatural density of colonies, all then forced to compete against each other. This unnatural host density also allows for an unnaturally elevated colony-to-colony transmission of parasites. 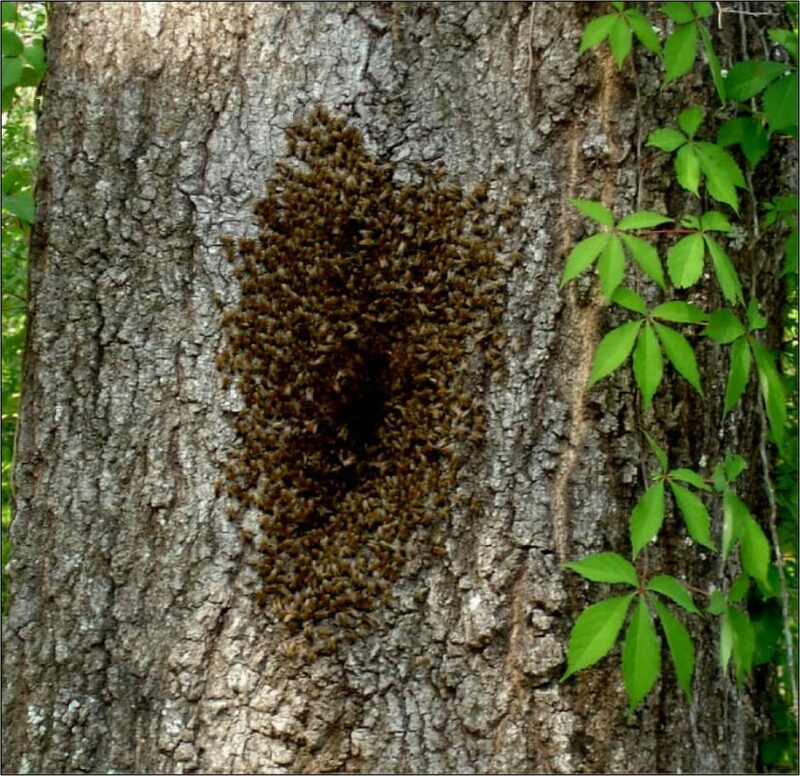 The only form of truly “natural” beekeeping that comes to mind is practiced in Africa and some other countries—where the bee “keeper” simply hangs a hollow log in the occasional tree and hopes for a swarm to move in, from which they can later steal some honey. Practical application: I came of age as a California “Flower Child,” am a long-term organic gardener, and live as close to an “all-natural” lifestyle as I can. So I have the right to say that the term “natural beekeeping” is an oxymoron. The moment that you place a swarm, package, or nuc into a hive, you’ve unnaturally intervened. And if the bees that you use are of commercial stock, it is even more unnatural. And if you place more than one hive in an apiary (or you have beekeeping neighbors), you’ve then created an even less natural situation. Figure 3. Honey bee swarms will readily choose manmade cavities in which to nest—they appear to base their choice upon location, volume, water tightness, and defensibility rather than whether it is “natural” or “artificial.” The swarm colony above is thriving in a narrow, rectangular, artificial cavity made of pressure-treated wood and plywood with urea-formaldehyde glue. Photo courtesy beekeeper Scott Ball. 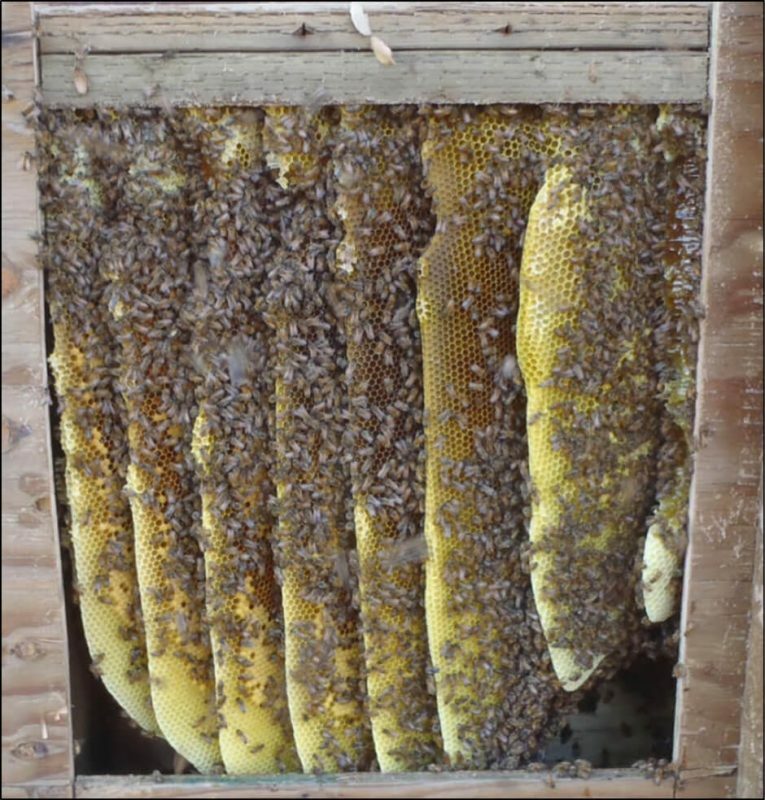 Now don’t get me wrong–I’m not saying that the above cavity will be best for thermoregulation during winter, but rather that the bees may evaluate the benefit of various methods or products differently than do the beekeeper. Practical application: using the word “natural” doesn’t put a halo around your head nor necessarily make a management method or product beneficial to bees. “Natural” is an arbitrary distinction—but it’s a good baseline to which any “improvements” can be compared. Similar to how humans appear to benefit from living in fabricated structures, and from eating diets of crops artificially selected for human edibility and nutrition, the honey bee can also not only adapt to unnatural cavities and management methods, but may actually benefit from some of them. O.K., now that we’ve got some facts straight, let’s start looking at the relationship between bees and beekeepers. We’re all sick to death of The Varroa Problem. The question then is how can Joe or Jane Beekeeper help to solve the problem. In order to do so, they need to understand why The Varroa Problem has not gone away on its own—as did the decimating plagues of the past that we suffered during the invasions of wax moth, chalkbrood, tracheal mite, and Nosema ceranae. Understand that there is no “balance of nature”—biological life continually adapts to the environment of our ever-changing planet. All life forms use the same “operating system” based upon DNA, yet that code is continually being modified via mutation and reordering, with the winning codes being determined by natural selection (most species–like the dinosaurs–eventually go extinct, since they did not adapt well enough). The honey bee, due to the multiple matings of the queen, as well as the bees’ notably high rate of genetic recombination, is expert at adaptation. And one of the environmental factors that bees need to adapt to are viruses—the rogue pieces of genetic material that hijack the cellular machinery of living things. Viruses are the ultimate parasite, stripped of any excess machinery—consisting simply of a set of genetic instructions coupled with a target-specific fusing/ injection mechanism. It’s debatable as to whether viruses should even be called a life form, as an infective virus can be created in the lab from scratch . Viruses only replicate–they don’t think, feel, eat, or have any “plan,” nor any necessary need to harm or kill their host (Fig. 4). They are perhaps the clearest example of how the process of evolution works at the genetic level, due to the simplicity of their reproductive process, as well as the fact that it takes place at such high speed. Figure 4. In the photo above one can see two adult bees with the deformed wings resulting from a severe infection of DWV when those bees were in the pupal stage. You can also see some prepupae apparently also suffering from DWV, plus a sick adult bee at the upper left unable to emerge from its cell. Of interest, there would be little or no fitness benefit to the virus from killing or deforming its individual host bees, unless the virus depended upon causing the colony to collapse in order to get dispersed to other hives. Practical application: viruses are everywhere—every living organism has means for dealing with them. The Varroa Problem is not only about varroa—the mite is only the vector. The real problem is the viruses—mainly Deformed Wing Virus. This virus has before our very eyes rapidly evolved to take advantage of its new vector. And beekeepers are part of why that came about. Varroa is a minor problem for its native host, the Eastern honey bee, Apis cerana. Humans started The Varroa Problem when we exposed the Western honey bee to the mite. Even then, it still took quite a few years for a novel strain of varroa–the Korea haplotype–to adapt to Apis mellifera, and then become today’s worldwide problem. Once this strain of varroa evolved to the point that it was able to effectively reproduce in Apis mellifera colonies, it changed the environmental niche of the honey bee—the colony now needed to deal with an immune-system-destroying parasite, along with a novel mode of exposure to viruses and bacteria introduced through the mite’s feeding wounds. Practical application: the honey bee is now in the process of evolutionary adaptation to this huge change. Beekeeping practices influence that evolutionary process. We humans have since inadvertently introduced varroa to nearly every population of Apis mellifera on the planet. Each initial invasion of the mite then decimates the established wild population of honey bees—but typically a few colonies survive. Those survivors then provide a low host density for the mite (fewer bee colonies), thus severely limiting hive-to-hive horizontal transmission­ of the mite. This minimizes the mite invasion pressure upon of the survivors, allowing natural selection to then take place, favoring those few colonies that exhibit some degree of mite resistance. Eventually, those somewhat resistant lines of bees reestablish a population. This has happened again and again. The evolution of Deformed Wing Virus. 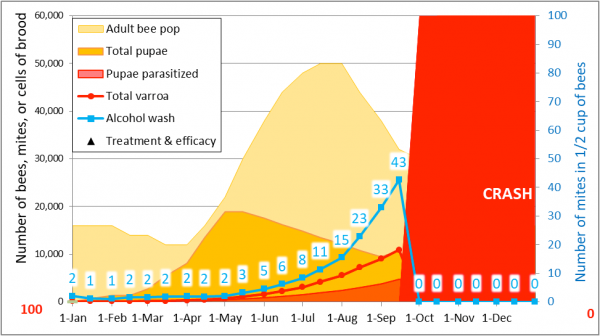 I’m not going to belabor our need for varroa-resistant stock—we all know that. It’s the next two things that we need to understand. After varroa first kicked our butts, it appeared that we could deal with the mite by treating once a year with an effective miticide. But then an obscure insect virus called Deformed Wing Virus evolved to take advantage of varroa as a vector and facilitator. Certain forms of DWV then coevolved with varroa to exploit an endless source of food—the worker brood in the continually-restocked colonies in managed apiaries large and small. We are now dealing with a monster—the varroa/DWV complex—in which both species mutually benefit from their “marriage.” This insidious symbiotic partnership is our nemesis, and will likely only get worse until we all keep mite-resistant bees. Practical application: so long as we keep providing an endless platter of brood in non-resistant restocked hives, nature will continue to select for mite/virus combinations that are best able to invade those new colonies. This is true for both bees kept as livestock and with those kept for recreation. Any beekeeper is not being part of The Solution if he/she stocks their hives with domestic stock and allows them to collapse due to lack of varroa management! It may help to understand the difference between a parasite and a parasitoid. Parasites generally benefit by not killing their host—think of fleas or ticks—their species do better with live hosts continually transmitting young parasites to new hosts. A parasitoid, on the other hand, requires that the parasite kills its host in order to complete its life cycle—a critical component of that life cycle being dispersal to a new host individual. In Apis cerana, varroa is an endemic parasite—always there at a low level, and vertically transmitting from parent colony to swarm , with little or no advantage to be gained by causing the collapse of its host colony. This can also be the case for A. mellifera, but so long as there are always other colonies within easy flight range, it will always be to to varroa/DWV’s advantage to kill its host colony in order to disperse by drift and robbing. Take home message: in the case of the varroa/DWV monster, causing the collapse of the host colony at the right time greatly increases the odds for that line of virus to be transmitted to other colonies. When a beekeeper allows managed colonies to collapse from varroa/DWV, that beekeeper is inadvertently giving an adaptive advantage to the varroa/DWV combinations that are the most effective at causing the death of their host colony. Restocking that varroa-killed hive with another package of domestic bees and then allowing it to again collapse in the same way is completely contrary to being part of The Solution. Neither varroa nor DWV benefit from causing the death of bee pupa or adults. But so long as beekeepers continue to maintain a high host density (lots of hives in the neighborhood), it then becomes evolutionarily advantageous to a DWV strain to kill its host colony–so that drifting bees and incoming robbers then better disperse that particular combination of varroa/DWV to surrounding hives . Practical application: it is only advantageous for the varroa/DWV monster to kill its host colony if there is a good chance that the collapse will result in the parasites being transmitted to at least two new colonies not yet infected by the specific genetics of the virulent parasites—otherwise it would be to the parasites’ advantage to not overly harm its host colony, and instead be vertically transmitted to its future swarms. The key factor is colony density—how many other colonies there are within flight range. It would also not be advantageous for varroa/DWV to kill its colony during winter cold, since that would also spell the death of that bloodline of mites and strain of virus. Thus I’d expect low density, unmanaged honey bee populations in long-winter areas (such as in the Arnot Forest) to rapidly develop stable host-parasite relationships with varroa/DWV. The best (most adaptive) timing for varroa/DWV dispersal to occur would be during the late-summer nectar dearth when robbing and bee drift is likely to occur (Figure 5). This must be balanced against the virulence of the varroa-DWV monster—if the mites were then to rapidly reproduce in the new host colonies, they might kill the colony during the winter. So the late-season timing is just right, since that’s when the colonies reduce broodrearing, and thus suppress mite reproduction. This allows the newly-introduced virulent varroa/DWV monster to lie relatively dormant until spring buildup begins. Figure 5. In the simulation above, starting with 100 mites in the hive, varroa overtook the colony in late August, finally infesting over a third of the brood cells. Due to the high infestation rate of the adult bees in August and September, the virus would suddenly go “epidemic” due to the amount of vectoring by the mite, and every mite during its phoretic phase would stand a good chance of feeding on an adult bee with a high DWV load, thus resulting in the pupae subsequently parasitized by those mites being overwhelmed by the virus. At collapse, drifting and robbing bees very effectively transmit both the mite and virus strains to surrounding colonies. Practical application: the marriage of varroa with DWV is a match made in hell, as far as managed bees are concerned, since so long as there is an unlimited supply of nearby hives to infect, it will always be to DWV’s advantage to kill its host colony in late summer or early fall. In this respect, varroa/DWV acts more like a parasitoid than a parasite—at the bee colony level—since the virus uses the drifting and robbing bees to infect its next host colony. It is the virus-induced collapse and resulting horizontal transmission that we do not want to evolutionarily reward. Thus, if we look at where the varroa/DWV marriage stands today, we see that there is selective pressure for DWV not to be too virulent (as are the paralytic viruses), as it could kill its host colony during winter or early in the season when little robbing takes place, but to be virulent enough that when the mite infestation rate exceeds around 15 mites per 100 bees in late summer, that the colony collapses at just the right time for transmission to other hives. This timing may be synchronized by the apparent increase in the efficiency of varroa as a vector as the duration of its phoretic phase increases during late summer —our understanding of this insidious relationship keeps growing. The bad news is that both varroa and DWV are able to evolve rapidly—the honey bee reproductive cycle typically takes a full year—that of varroa, around 17 days, and for DWV, mere hours. And as suggested by genetic analysis by Andino  varroa is likely still adapting to its new host, and may eventually become an even more successful parasite unless we start breeding bees that can fight it on their own. And you can bet money on DWV continuing to evolve ! All is not doom and gloom. The honey bee is demonstrably able to overcome the varroa/DWV complex. It’s really up to us beekeepers whether we continue to contribute to The Problem. In the next installment I’ll go over the pros and cons of the various proposed options for beekeepers, big or small, wishing to be part of The Solution. Thanks as always to Pete Borst for research assistance, and to all the dedicated and hard-working bee researchers from whose publications I draw useful information. Bee Scene 33(3): 27. British Columbia Honey Producers’ Association. Blacquière, T & D Panziera (2018) A plea for use of honey bees’ natural resilience in beekeeping. Bee World, 95(2): 34-38. Open access. Neumann, P & T Blacquière (2017) The Darwin cure for apiculture? Natural selection and managed honeybee health. Evolutionary Applications 10:226–230. Open access. Thymol can actually leave substantial residues in the combs, perhaps depending upon the method of application. But those residues would not generally be considered to be of concern to human health, and based upon my experience with Apiguard®, do not appear to have an adverse effect upon colony buildup following treatment. Yes, I understand that the swarm is actually the parent colony (containing the old queen), with the daughter colony (with a new queen) remaining behind. Apis mellifera appears to exhibit a greater propensity for the robbing of weaker colonies than does A cerana (Anna H. Koetz, AH (2013) Ecology,behaviour and control of Apis cerana with a focus on relevance to the Australian incursion. Insects 4(4): 558–592), perhaps to avoid horizontal transmission of the mite. Such dispersal of a pathogen is termed “horizontal transmission.” This concept is nicely reviewed by Nolan, MP IV (2016) Impacts of inter-colony distance, mite host choice, and colony polyandry on the host/parasite relationship between Apis mellifera and Varroa destructor. Dissertation, University of Georgia. Piou V, et al (2016) A. Impact of the phoretic phase on reproduction and damage caused by Varroa destructor (Anderson and Trueman) to its host, the European honey bee (Apis mellifera L.). PLoS ONE 11(4):e0153482. Andino, GK, et al (2016) Differential gene expression in Varroa jacobsoni mites following a host shift to European honey bees (Apis mellifera). BMC Genomics 17:926. Martin, SJ, et al (2012) Global honey bee viral landscape altered by a parasitic mite. Science 336: 1304-1306.